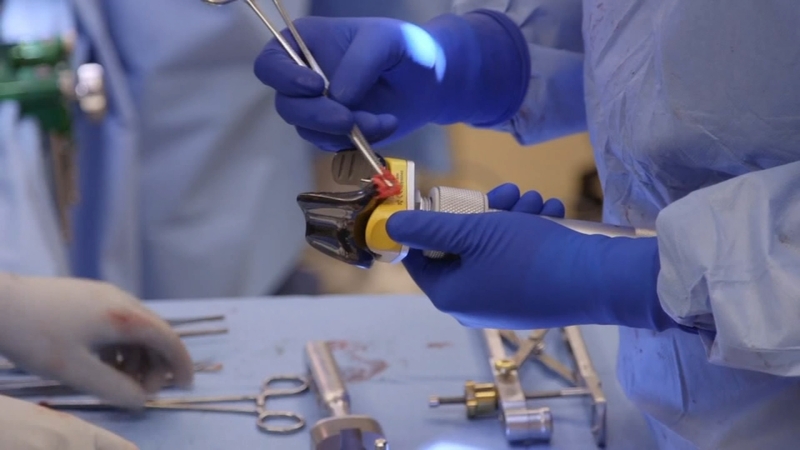 SAN DIEGO (KFSN) -- A robotic-assisted system called Navio is helping doctors with total knee replacements in the operating room. The technique was approved by the FDA in 2015, and a special patient at Saint Rita's Catholic Church calls the procedure heaven-sent. It's hard to keep up with 79-year-old sister Margaret Castro these days. Last year, knee pain made trips to her upstairs office excruciating. "I would get to a third step and then I'd have to hang on to the wall, and I'd walk holding on to the wall to get to the door. And I never said anything to anybody," Sister Margaret shared. Sister Margaret worked in leper colonies in India with Mother Teresa for 15 years as a girl. She's tough, but her knee pain got to be too much. She called Scripps Orthopedic Surgeon David Fabi, MD, who told her about the robotic surgery system. Dr. Fabi said, "It essentially allows us to customize the knee replacement to that patient's specific needs, the specific anatomy." There's no pre-surgical MRI or CT scan. Dr. Fabi has the Navio in the operating room. Using sensors on the knee, it produces a 3D image that helps him precisely align the knee replacement. Dr. Fabi explained, "We were hitting about, at best, 90 percent target rate. What the robotic technology and computer technology provides is that now we are able to achieve 98, 99 percent accuracy." Sister Margaret says she was out of the hospital in two days and back at work in three. She said, "When I come just to work every day, I don't pay attention to my knee. I just go about my work, and I forget all about my knees, and that's fantastic, you know!" She says her knee is as good as it's ever been. A nun's prayers answered. Dr. Fabi travels around the world to teach other surgeons how to use the Navio robotic-assisted knee replacement system. He says in the future, the system may help in hip replacements.